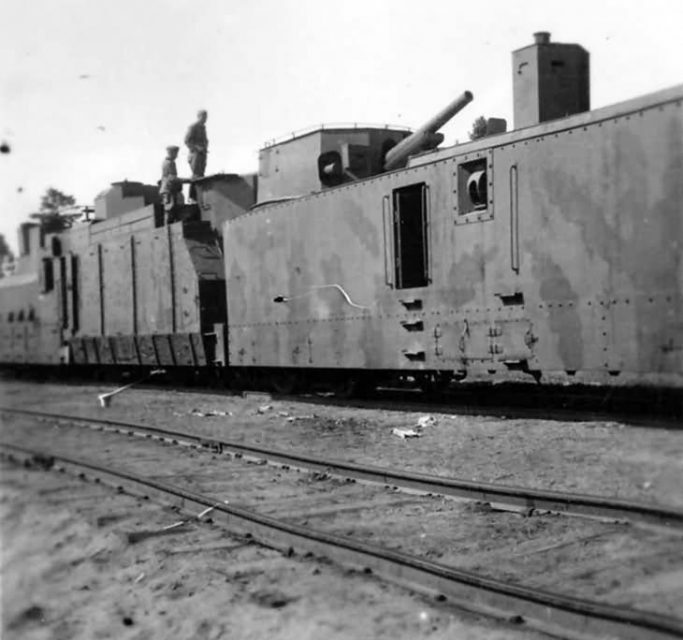 Armored trains showed their effectiveness during the Civil War in Russia in 1917-1922. They were used as a means of transportation for people and transportation of guns, also as mobile hospitals, with their help convoying and added fire support. 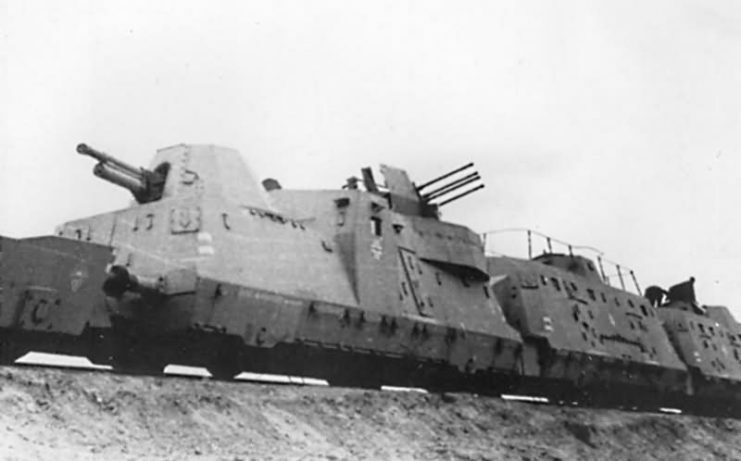 After the outbreak of the Great Patriotic War (WWII in the USSR), the Soviet government decided to build a number of new armored trains and deploy railway anti-aircraft defense batteries. On November 4, 1941, at the Sevastopol Marine Plant, the armored train called “Zheleznyakov” was built. Its main tasks included the defense of Sevastopol. 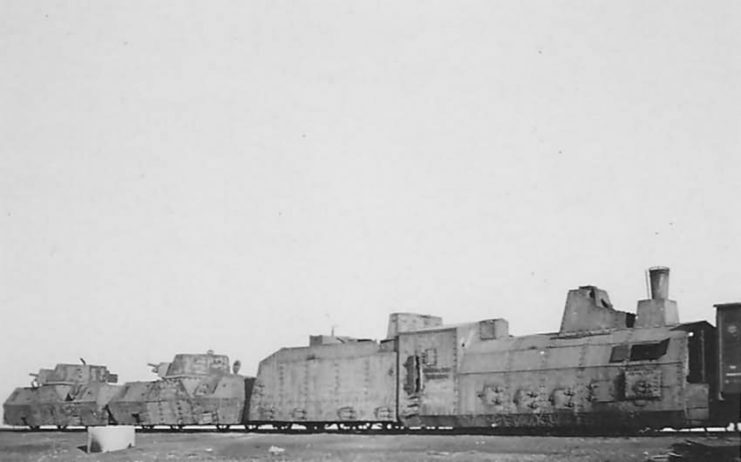 A crew of sailors of the Black Sea Fleet was recruited to serve on the armored train. 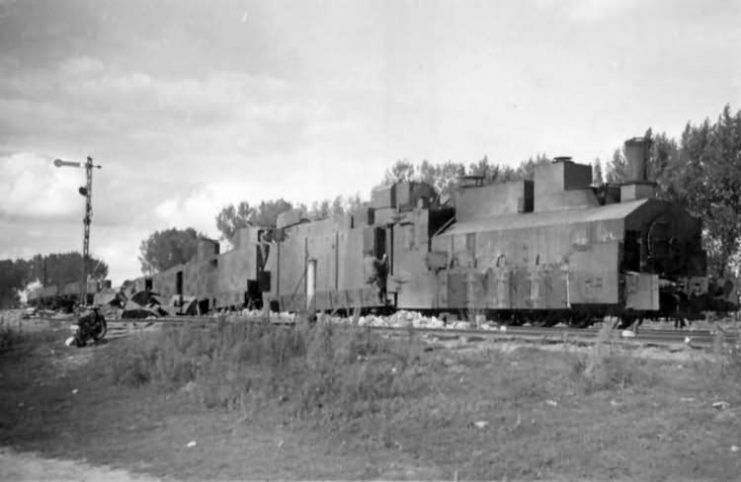 The basis of the armored train was flatbed wagons, plant workers welded armored plates 15-30 mm thick and reinforced them with concrete. The number of railroad cars was usually 4. The cars were driven by a locomotive with a steam power plant with increased power of up to 600 hp. The maximum speed was 50kmh (31mph). 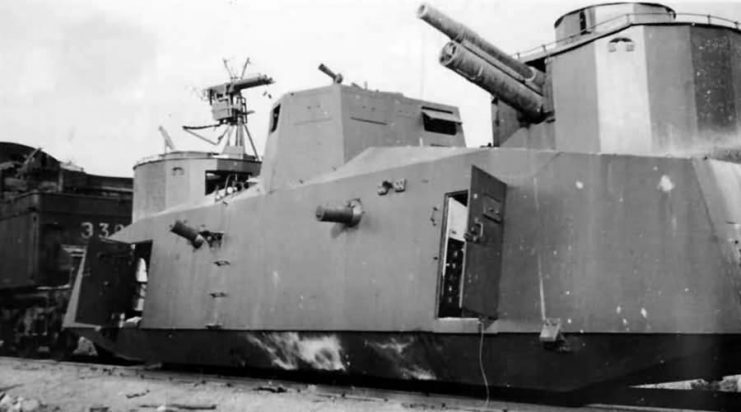 The Armament Zheleznyakov consisted of 14 x 7.62 mm Maxim machine guns, a 3 x 76 mm artillery installation 34-K, 2 × 82 mm mortars, 2 × 76mm air-defense gun M1914/15 and 2 × 12.7 mm machine gun DShK. On November 7, 1942, Zheleznyakov began to perform combat missions, and the first of its commanders was Captain Sahakyan. 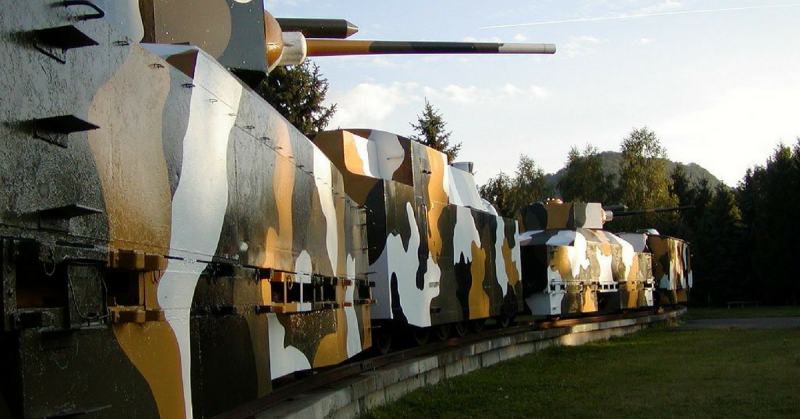 Throughout the period in 1941-1942, the armored train went on more than 140 missions. With the help of guns and machine guns, it supported the infantry, suppressed German artillery batteries, entered into an open battle with tanks and shot down German aircraft. 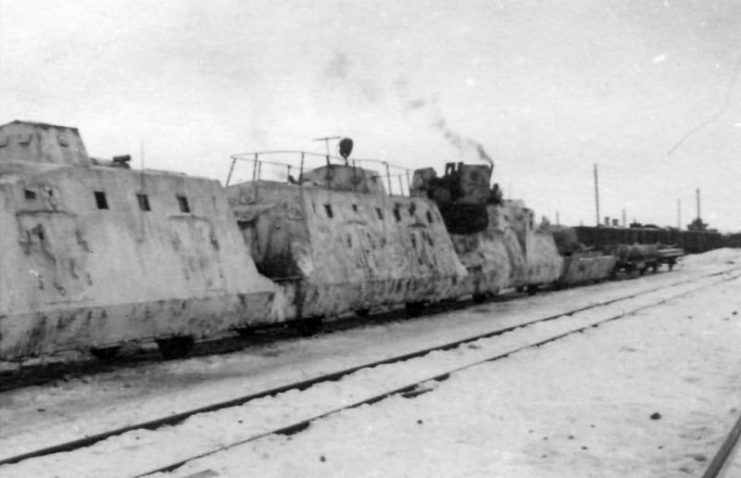 Captured Soviet Armored Train in Crimea. Zheleznyakov conducted military operations at the front line of the attack, which allowed it to inflict serious damage on German troops. From January 7 to March 1, 1942, the armored train destroyed thirteen machine-gun nests, nine bunkers, one heavy battery, six dugouts, three cars, three airplanes, ten wagons with cargo, up to 1,500 soldiers and enemy officers. German pilots repeatedly tried to track down the armored train and destroy it. Each time, Zheleznyakov took refuge in narrow excavations of rocks or tunnels before the Germans had time to raise aviation or react with artillery. Moving at night helped to camouflage it from enemy sights. For the quickness and elusiveness of Zheleznyakov, the Germans called it “The Green Ghost”. On December 29, 1941, during an air raid German pilots still managed to inflict significant damage to Zheleznyakov. 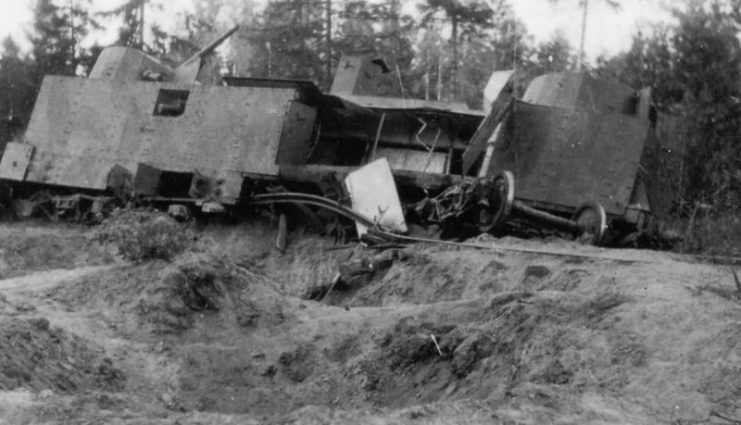 As a result of the air raid, many members of the crew of the armored train were killed. However, on January 1, 1942, they took revenge and shot down two German fighters. On June 15, 1942, Zheleznyakov joined a battle against a column of German tanks. The guns were fired from a distance of about 400 meters, which allowed the armored train to destroy at least three German tanks. On June 26, 1942, more than 50 German bombers struck at the base of the Green Ghost – along the Troitsky Tunnel. As a result of the air strike, the second armored car was buried under rubble. However, the exits of the tunnel remained open. 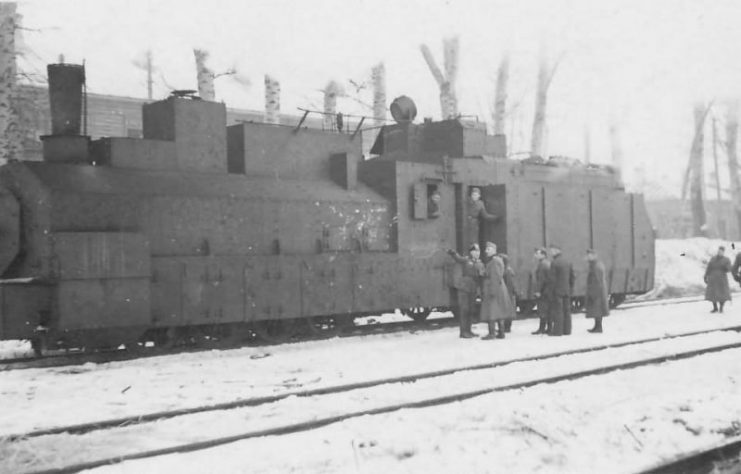 This was used by the crew of the armored train and unexpectedly for the Germans out came the surviving part of Zheleznyakov, which again opened fire on the enemy. The next day, on June 27, the German aircraft made another air raid and the only way out of the tunnel was destroyed. The surviving crewmembers took up defensive positions near the thermal power plant. 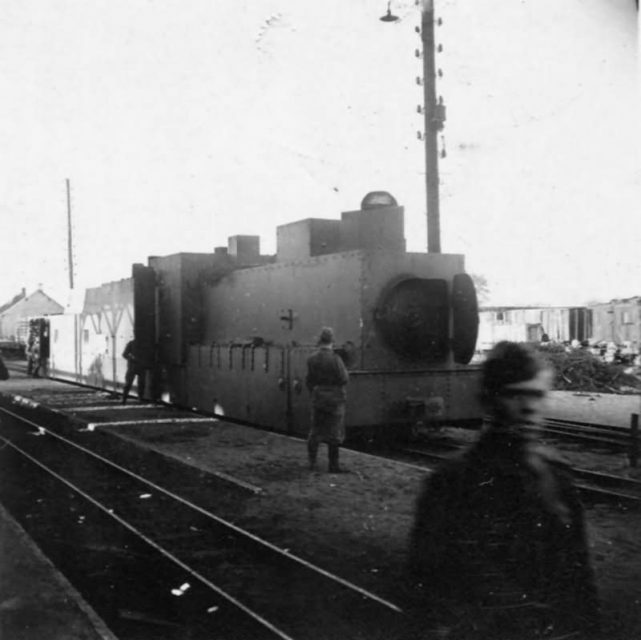 On June 30, the Sevastopol garrison received an order to leave the city, and a couple of days later the crew of the Green Ghost decided to blow up their armored train. In August 1942, German troops cleared the Troitsky tunnel and decided to restore the armored train Zheleznyakov. From the rebuilt armored train the Germans created the train “Eugen” («Ойген»), equipping it with howitzers with a caliber 105 mm. 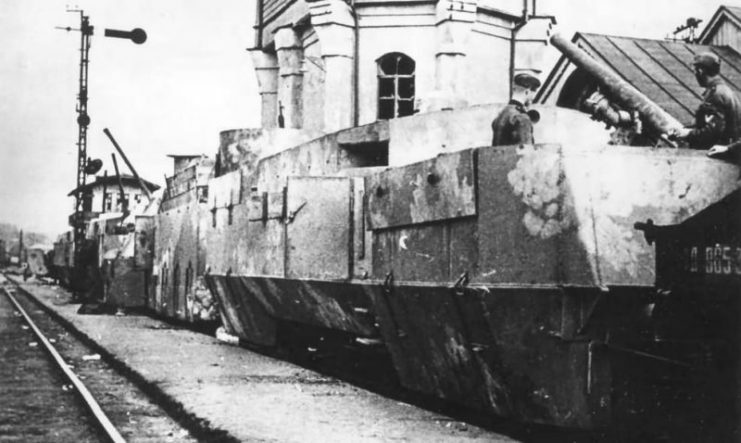 After that, the German armored train fought against the Soviet army. In May 1944, when retreating from the city, it was blown up by the Germans at a railway station. After the end of the war, the restored locomotive Zheleznyakov was used for pulling wagons to Crimea. On October 24, 1967, the former front-line brigade delivered it from the railway depot of Dzhankoy to Sevastopol. At present, Zheleznyakov has been turned into a Historical monument and is one of the many sights of Sevastopol.